… or, when the pure love of motorsport meets a strong management style. This year, 2008 has been quite a year for Pacific Coast Motorsports. It started off smooth enough, the kick-off party at the Hard Rock Hollywood was a complete success. Members of the C-300 volunteer group in Long Beach, luminaries’ from the Grand Prix of Long Beach Association, card carrying Screen Actors Guild members, photographers, and fans enjoyed themselves under the guitar and beside the Atlantic racing cars before retiring inside for food and chat. At that time, back in the middle of February, Pacific Coast Motorsports, under the management of team president, Tyler Tadevic, had plans to compete successfully in two major American open-wheel series. 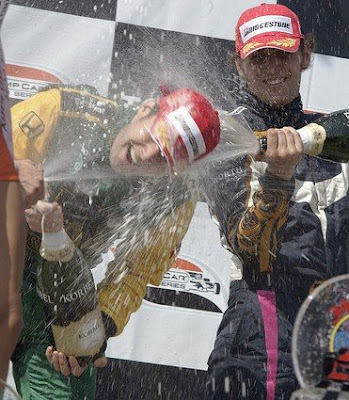 After all, in 2004, the team had put together a series championship winning campaign with Jon Fogarty and was looking to do the same in the ChampCar World Series after what the team had learned from completing its first season in 2007 with a two car, three driver effort with Alex Figge, Ryan Dalziel, and later, ChampCar veteran Mario Dominguez. In about the time it took the PCM transporter to leave Oxnard and drive to Sebring for the first at speed testing for the Atlantic series where Frankie Muniz (yes that, "Malcom In The Middle" star, Frankie Muniz), and Carl Skerlong were anxious to get the season started … an announcement came down that the CCWS would merge with the Indy Racing League starting immediately. The investment in equipment and relationships that had been forged over previous years that were planned out and put in place, in order to compete at the highest levels of professional motorsports had to be totally re-assessed in a bizarre game of high-stakes 52 card pick-up. What was once viewed as a 2008 sophomore season chase toward a championship title with American born driver (a dwindling breed) Alex Figge, just became a rookie motorsports competition effort with new equipment, new tracks, new rules, and no driver, no sponsor. All of this with the prospect of having to run one last race through the streets of Long Beach in about two months. Written by: David Phillips - Senior writer, RACER Magazine - http://www.racer.com - 04/29/2008 - 04:50 PM - Oxnard, Calif. The situation is rather different at Pacific Coast Motorsports, where the IndyCar Series’ newest team owner – former team president Tyler Tadevic – has gone into hock up to (and past) his ears to field a pair of Dallara-Hondas for the coming season. And even that wouldn’t have been nearly enough but for the 11th hour arrival of the “Visit Mexico” sponsorship program, courtesy of driver Mario Dominguez and the Tourism Bureau of Mexico City. Then again, the fact that a team is competing in the 2008 IndyCar Series thanks largely to sponsorship may be the most encouraging sign yet of the altered financial dynamics wrought by the reunification of Indy car racing. Truthfully, PCM is already something of a poster child for the shifting sands of American racing in the 21st century. Founded in 2003 by banker Tom Figge in support of his son Alex’s racing career. PCM then ran the American Le Mans Series and Grand-Am GT in ’05 before finishing the year in Daytona Prototypes. A full season of Daytona Prototypes followed with another one in the cards for ’07 until a chance meeting between Tom Figge and Kalkhoven led PCM down the Champ Car path. PCM entered into a partnership with Shane Seneviratne to bring the US RaceTronics Atlantic team under its wings [for 2008]. [The CCWS/IRL merge agreement] spelled the end for the Figges’ cycle of investment, liquidation and re-investment . . . and the emergence of Tadevic as the new owner of the team. Fortunately, Dominguez arrived with that missing two with a three to boot – as in a third-place finish in the Champ Car swan song at the Toyota Grand Prix of Long Beach. The deuce? That would be the Visit Mexico sponsorship. “All kudos go to Mario,” says Tadevic. “He’s been working on this program with Mexico City and he was good enough to give us the opportunity to meet with those people. “The program has a lot of potential going forward. We are extremely proud, not only to have Mario but to represent a city the likes of Mexico City. PCM will have to make due with two “used” cars that only arrived at its shop in Oxnard, Calif., the Wednesday before the Long Beach race. The team unloaded its two Dallara-Hondas from the transporter, loaded two Panoz-Cosworths and headed down the coast to Long Beach where Dominguez capped a highly competitive weekend with a fine third place. Although Tadevic sees Long Beach as a sign of PCM’s growing maturity, he is also keenly aware of the monumental challenge that remains, one that includes not only the IndyCar Series but PCM’s continuing relationship with Seneviratne and US RaceTronics. “First, we’re not exactly ‘newbies’ when it comes to doing something new and second, with the Atlantic program we’re proud to keep that going and we’re thankful to Mazda and Cooper Tires to keep that series up and running. Third, over the winter, we hired some really capable people with IRL and oval experience, including Didier Francesia a chief mechanic from Target/Ganassi, and we have (crew chief) Roy Wilkerson and (mechanic) Chuck Miller who were with us last year and have a significant number of Indy 500s and time in the IRL under their belts. “I’ve become pretty good friends with Michael Cannon, race engineer at HVM,” says Tadevic. “Michael told me the other day, ‘You’re the most ambitious man in motorsports.’ I think what he was really saying was that I’m either the most ambitious man in motorsports – or the stupidest. But we’ll see. All I can say for now is that failure is not in the scope of things. The key to Pacific Coast Motorsports and Tyler Tadevic's management style (and the absolute love of the competition provided through racing automobiles) can be found in this Tadevic statement, “Every off-season we liquidated what assets we had procured for the series for the season before and throw those funds back towards a new series. It is this tough but smart management strategy through the years at Pacific Coast Motorsports that has allowed Mario Dominguez, at this very moment, to pursue the lifelong dream of competing at the Indianapolis 500. The dream begins Sunday, May 4, with the gates at the Indianapolis Motor Speedway track open for spectators from 9 a.m.-6 p.m. ... with the Rookie Orientation Program on track from noon-5 p.m.
We, here at The EDJE, are doubleing down on the success of Tyler Tadevic and the Oxnard, California based team at Pacific Coast Motorsports. The Indy 500 has announced two Chevrolet Corvettes will serve as this year's pace car, with former champ Emerson Fittipaldi as the driver. This is Chevrolet's 19th time serving as the race's official pace vehicle and the 10th time a Corvette has been used. 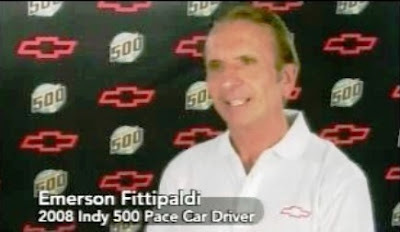 To start the race, Fittipaldi will drive an ethanol-powered Corvette Z06 E85 concept car. The next vehicle he will drive is a special edition Corvette, designed to commemorate the 30th anniversary of the 1978 Corvette Indy 500 pace car. The race broadcast was delayed due to a playoff in the LPGA Golf event in Miami being shown on ESPN2. The broadcast begins with the race in its second Yellow Flag caution period brought about by T-Team Will Power KV Racing Technology driver spinning and hitting the wall. Not a great start for the Round Three winner of the Toyota Grand Prix of Long Beach and the last ChampCar World Series event. The two open-wheel racing series are fully united beginning with this oval race. Simon Morely of Luczo Dragon/Symantec Racing takes a hit, and keeps on ticking. On the second yellow flag, brought about when last week’ race winner in Long Beach, Will Power spun and tapped the wall, which sparked a round of pit stops, Tomas Scheckter - Luczo Dragon/Symantec Racing, pulled in and was having his tires changed; Marty Roth locked up his rear wheels and hit the pit crew worker, Simon Morely, working on the right front of Schsckter’s car. Marty Roth drops out after 57 laps with balance problems (the lack of balance probably helped with his spin earlier). Green flag pit stops – lap 76 Milka Duno - Dreyer & Reibold Racing, spins car in pits. Conquest Racing has had problems all race beginning with Ernesto Bernoldi spinning in the first laps and then on lap 84 Jaime Camara pulled into the pits with a problem. Near halfway at lap 95, Target teammates are walking away from the field in lockstep. Dixon and Weldon, running about a quarter a second apart and at least seven seconds ahead. Viso and Scheckter collect each other while Tomas was passing along the top. EJ’s right front notched in front of Tomas’s left rear at lap 99. EJ Viso solders on after a change of flat spotted tires. Tomas Scheckter is not so lucky - OUT. Justin Wilson benefits from the yellow flag and makes up one lap. Vitor Miera in the Delphi/National Guard car, while pulling out of the pits, taps one of Buddy Rice’s laid out tires and bends the left front suspension – OUT. Green, Green, Green on lap 106 – Tony Kanaan - Andretti Green Racing, and Helio Castroneves - Penske Racing, get a jump. EJ Viso – HVM Racing, is one lap down but gets an impressive run as well. Viso begins to block Ed Carpenter around lap 110, almost catches a black flag but is contacted on the radio and reminded of the rules. Lap 120, Newman/Haas/Flannigan Racing teammates Graham Rahal and Justin Wilson run side-by-side at 13 and 14 on the lead lap about 7 seconds behind. The compound of the tires is the same as they used at Homestead - Hard. The temperatures at Kansas being in the high 50’s to very low 60’s are having the tires take a while longer to heat up. Danica Patrick – Andretti Green Racing, saves her car in a three wide racing incident when she was caught on the outside of Marco Annette while he was passing Mario Moraes. Patrick slid up the track missing the wall and saves the car. Lap 148 finds Scott Dixon – Target Chip Ganassi Racing, leading teammate Dan Weldon by less than a half a second followed by Tony Kanaan of AGR. Green flag pit stops are anticipated in 5-6 laps. Ed Carpenter - Vision Racing, reached fourth place and pitted, Buddy Rice – Dreyer & Reinbold Racing, brings out a yellow flag at lap 153 by hitting the wall. EJ Viso pulled into the wrong stall (Vision Racing) and further messed up Ed Carpenter’s pit stop. Pits Closed, Dixon was in when the Yellow Flag came out but took fuel only, other cars pull in while the pits are closed to get a splash of fuel which is allowed. Patrick has a poor pit stop when the right rear tire could not get remounted. The mounting studs had been worn down when the previous mounting was placed on the axel mount plate, loosely. Danica Patrick – OUT. Ed Carpenter looses a lap after being counted for the fourth position before the fourth caution and pit mishaps. Carpenter takes the restart on lap 173 of 200 at P9. Dixon has to restart in P7 because of the in pit Yellow timing. ... And that Viso, I don’t know who he is even. He’s new and he’s got a pretty fast car. He’s learning the ropes of this oval racing. He almost put me in the wall at one point. I was like, ‘Look dude, you’re new. You better be nice because we all know how to handle this a little better than you do at this point.’ It’s all right. You got some newcomers and they’re going to be trying to push it. They’re not going to know how. They’re not going to know what they can and can’t do. There’s a lot of etiquette to learn in oval racing. It takes a little time. Yeah, there was close racing out there, but didn’t end up racing close at the end." Nine cars on the lead lap of seventeen cars still on the track. Dan Weldon gets a good start. EJ Viso gets a stop and go penalty for the pitstop mishap with Carpenter. Dixon has trouble getting around AGR/Panasonic Rookie Mutoh on lap 178. Scott Dixon catches up to the two Penske cars and he clears them in a one lap short order. Dixon now third and behind four seconds. With fourteen laps to go its Weldon, Kanaan at .031 behind, with Dixon about one straightaway behind. Dixon is catching up running at 212 mph but there is not enough laps left for him to change position. Carpenter runs out of fuel at lap 194. In and out of the pits. Kanaan looses ground to Weldon in the next to the last lap and Dan Weldon coasts on to win. The incident on lap 153 set the table for the end of the race. Dan Weldon becomes the first repeat winner at Kansas Speedway in the history of the track. This is also a first win for Dan Weldon after he became a married man. “This is good leading into Indianapolis”, stated Dan. The win brings him to third in points after four rounds. EJ Viso was happy with the car and the performance in the race. “I just got confused and made a mistake”, said Viso of the pit stall mix-up with the Ed Carpenter pit on lap 153. Scott Dixon has three strong performances in four races and gets bit again when the yellow flag flies while he is in the pits … and looses position. 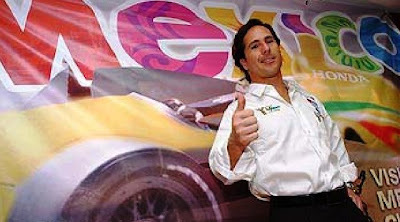 Starting with the Indianapolis 500, Pacific Coast Motorsports with Mario Dominguez will become the tenth T-Team driver to join the 2008 season. A good first truly unified race going into the month of May and the ramp-up to the INDY 500. Rookie orientation (which means most of the Fine Nine) will begin in one week and 14 cars are expected on the track. - Kanaan sounded severely pissed off during live streaming, saying the team really needed to notch up a gear or two as the car was just SLOW. Danica in third when the other three Andretti Greens trail behind in 11th, 13th and 14th. - Roth Racing's Marty Roth in 7th. What the heck? But as Scott Dixon told the pit reporter: "Qualifying doesn't mean a lot at Kansas, you can start last and still work your way up the field and win." Fresh off of a podium finish at the last and final ChampCar World Series race held on the streets of Long Beach April 20th, 2008, Mario Dominguez and Pacific Coast Motorsports appear to be on the verge of pushing the chips to the middle of the table for a run at the IndyCar Racing League 2008 Championship season. At Long Beach, the team showed its potential and Dominguez spoke of possibly returning to race at the Indianapolis 500. "Knock on wood, we'll be there with Pacific Coast Motorsports and myself as a driver by the Indy 500," he said. "Every since I can remember, I've always wanted to race in the Indy 500." "It is a sad moment for me because I will miss Champ Car, I loved Champ Car and I will always be so proud to have won in Champ Car. But, there has to be one series; that is very clear. "The future is bright, I am sad but at the same time happy, in the end, the fans will be the winners and that is terrific and I hope to be part of that. This is where I made my name and this is where I made my career, but my future starts right now." Pacific Coast Motorsports would join KV Racing Technology, Conquest Racing (with consulting services from Forsythe Performance Research - a redirected Forsythe Racing effort), Dale Coyne Racing, Newman/Haas/Lanigan and HVM Racing as former ChampCar teams who have made the transition. With three race weekend races in the can, Mario and PCM will be starting out not as far behind as one might think. Now, if only they can get credit for the points earned by the third place showing at the Long Beach Grand Prix! Pacific Coast Motorsports is pleased to announce their entry into the IndyCar Series, with Mario Dominguez driving the #96 Visit Mexico City/PCM/Dallara. 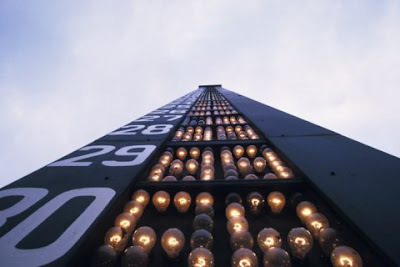 The Mexico City Tourism Board is the primary sponsor of the PCM entry and the program will commence with the 2008 Indy 500. PCM team owner Tyler Tadevic joined Mario Dominguez and representatives of the Mexico City Tourism Board at a press conference in Mexico City this morning. Mario Dominguez, 32 is a native of Mexico City . He was honored with the title of “Official Driver of Mexico City” last fall by Mayor Marcello Ebrard. Dominguez will make his rookie debut in the IndyCar series at the world’s most famous motorsports event, the Indy 500. Pacific Coast Motorsports has received two Dallara chassis. The team will debut the #96 entry with Dominguez at Rookie orientation at the Indianapolis Motor Speedway, Sunday, May 4, 2008. Formed in 2002 and based in Oxnard, California, Pacific Coast Motorsports are champions on the track and in the marketplace. The 2004 Toyota Atlantic Champions have competed in a diverse array of motorsports challenges, from open wheel to sports car racing and succeeded in every discipline. Off the track, PCM has been sponsored by some of the countries most recognizable names, from Imperial Capital Bank ... to Menards, TECATE and Vonage ... to Uniden --- and now, Mexico City D.F. The Toyota Grand Prix of Long Beach was a good race and a nice parade lap for the final event of the American open-wheel racing series known simply as ChampCar. In this video taken from the press conference that featured the podium finishers of this final race featuring the rules, equipment, teams and drivers of the ChampCar World Series (CCWS), Australian Will Power, Swiss/Frenchman Franck Montagny, and Mexican born Mario Dominguez share their reflections and insights. 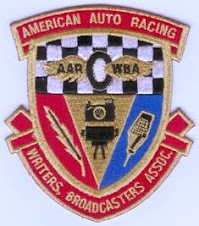 The CCWS was an American rules sanctioning motorsports series which stressed racing in venues that optimized driver skill on temporary street courses, airport runways, closed road circuits, in North America and international localities. The press conference was conducted by the Fred Nation, Executive Vice-President of Communications of the now ruling sanctioning organization, the Indy Racing League. 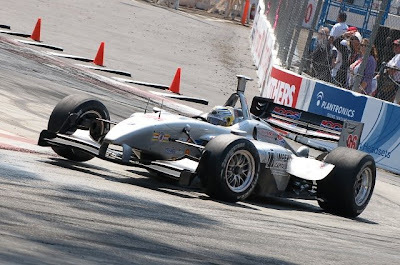 The IRL will stage the Grand Prix of Long Beach in 2009 and beyond for at least the next ten years. The conference opens with third place finisher, Mario Dominguez – Pacific Coast Motorsports. Mario discusses the car, the team and the fact that he had not been in an open-wheel racing machine in over six months. Second place finisher, former Formula One driver Franck Montagny, in his first Champ Car start … and finish reflects on why he chose this series to compete in. Race winner, Will Power, who started third in the 20-car field discussed the importance of his start. Will Power led most of the way Sunday in the streets of Long Beach, winning the final race of the Champ Car World Series, the last remaining remnant of the 12-year rivalry between the newly unified American open-wheel series. Less than 24 hours after a historic IRL victory by Danica Patrick, the first woman to win an IndyCar race, the final race for the series that began as CART in 1979 was run before a large, appreciative crowd. That included Patrick, who arrived after a 12-hour plane ride looking refreshed and very happy midway through the event. Power, who started third in the 20-car field, spoiled the show a bit, though, jumping into the lead with a great start and leading most of the 83-lap, 1-hour, 45-minute timed race. "Yeah, it was a very nice day, really good start, good pit strategy and we were very quick," Power said. "I just want to thank (my team owners and team). I feel really happy for them and the team to win the last Champ Car race." He added, "We had problems all weekend, just little problems. But we fixed everything for the race. My engineer did a great job, the car was nice and it all came together in the race. I was just cool in the car, relaxed. When it comes together, it just comes together nicely." Twelve of the drivers in the Toyota Grand Prix of Long Beach do not currently have rides in the IRL, but two of them, former Formula One driver Franck Montagny, in his first Champ Car start, finished second, followed by longtime Champ Car star Mario Dominguez. Rookie Enrique Bernoldi and Oriol Servia, both transitional drivers, finished fourth and fifth. Graham Rahal, the 19-year-old son of longtime racing star Bobby Rahal, who became the youngest driver ever to win a major open-wheel race two weeks ago in the IRL event in St. Petersburg, Fla., spun twice and finished 13th on Sunday. The youngster had moved back up to seventh when he spun trying to pass Franck Perera, another transitional driver, for position on the last lap. Justin Wilson, the driver who replaced Sebastien Bourdais, who won the last three Long Beach races for Newman/Haas/Lanigan Racing, started from the pole but lost the lead to Power moments after the green flag and wound up completing only 12 laps before going out with a mechanical problem. Former CART champions Jimmy Vasser, who came out of a two-year retirement to drive here, and Paul Tracy, who didn't have a ride until earlier this week, finished on the lead lap in 10th and 11th. The “Fine Nine” is what we, here at The EDJE, have dubbed the drivers who were able to secure seats with teams that were formed to compete in the now merged ChampCar World Series. So the transition drivers account for four of the top ten positions in the chase for the series championship after only three races. Not bad for all of the sad predictions of how well ChampCar teams and drivers would fair in the new, bigger, unified Indy Racing Series. This will be the first and only season where the term Merge and Transition will make any difference at all. T-Teams and Established Teams (or E-Teams) for this season are a statistical side-bar and a study in motivation dynamics for those who enjoy the “inside baseball” nature of motorsports. The final ChampCar sanctioned Long Beach Grand Prix by any measure was a grand success ... from the large, enthusiastic crowds, competition for a podium position at the end of the race, an international podium, a surprise appearance by the first female to ever win a major professional open-wheel racing series race in Danica Patrick, plus positive wishes from the ChampCar drivers, teams, and fans for a great IndyCar Racing Series championship in the unified season ahead for 2008. Danica Patrick, through the arrangement of the management of the Indy Racing League, held a news conference at 4:15pm PT in the press conference room at the Toyota Grand Prix of Long Beach. An honorable gesture was carried out by the IRL to have the woman who became the first-ever female motorsports driver to win a race in a professional open-wheel automobile racing series give a second news conference so soon after traveling from Japan to the Grand Prix racing venue in Long Beach. This conference in Long Beach was held just 19 hours after Danica won the IRL race at Twin Ring Motegi, Japan and helps to strengthen the move toward unification of the two American Racing series (the merge of ChampCar into IndyCar). The conference followed immediately after the ChampCar World Series podium winners conference and interview at the end of this, the final race featuring the rules, equipment, teams and drivers of the CCWS. The winner of the Toyota Grand Prix of Long Beach, Will Power – KV Racing Technology, stated clearly that his hat was off for Danica and that she had earned the win through skill and strategy. Thanks to the Indy Racing League for making this happen … a class act! In the video, Danica discusses the final laps strategy and the end of the race, celebrating, and the team day planned for AGR at the American Honda facility in Torrance, California tomorrow. On a day where the possibility of water seeping onto the race track threatened to postpone racing at Twin Ring Motegi, Japan (as it had done the day before), Danica Patrick uses her skills and her cool foot to out drive, out pace, and out last the top echelon of Indy Racing League drivers to become the first-ever female driver to win a race at the highest levels of professional open-wheel automobile racing. 2008 will easily go down as a year of firsts in American Motosports! First unified open-wheel racing season in well over a couple of decades (INDY perspective). 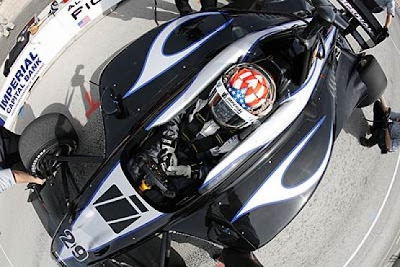 The youngest driver to win a professional open-wheel automobile race (Graham Rahal at age 19). First team to win an IRL race other than the three top teams in the IRL since 2005 when Newman/Haas /Lanigan placed Graham Rahal in the top spot in St. Petersburg. And NOW - - - The first woman to ever win a race at the highest levels of professional open-wheel automobile racing. All of this activity and we are only two and a half races (or is that three?) into an eighteen race season. The Dallara chassis may be old, but it still races as long as there are teams and drivers to suit up and show up. Whats next? A ChampCar T-Team takes the championship points lead? If Graham Rahal wins in Long Beach tomorrow, he will be second in the points with three full races into the season (or is that four?). 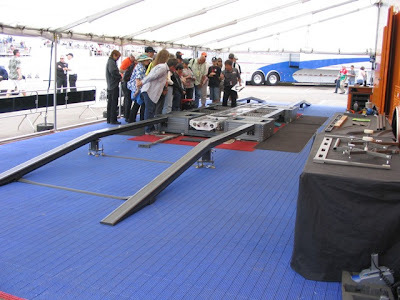 On Thursday, April 17, 2008, at 11:00am, the kick-off event to the four-wheel Grand Prix speedfest through the streets of Long Beach was held on the western sidewalk in front of the Long Beach Convention Center and not one engine rev was heard. The event was the third time in three years where the city of Long Beach honors the motorsports stars that have either lived in Long Beach or have graced the oceanside city with their talent, along the way to a pinnacle career behind the wheel in sporting competition. A one-of-a-kind, two-foot in diameter medallion was cast, listing the name and accomplishments of the honoree, and then set in cement for all race fans and visitors to see as they walk down the east side of Pine avenue in front of the Convention Center. This year was witness to the honoring of three towering legends of motorsports in Mario Andretti, Parnelli Jones, and Gary Gabelich and, to be honest, while these men were honored through the ceremony on Pine Avenue, Long Beach became the biggest winner in the exchange. The Long Beach Motorsports Walk Of Fame induction ceremony helped to put aside the fact that this year is the last year the ChampCar World Series cars and management will be putting on the event of the race (as some of the people involved have) for over twenty years. It is a melancholy year, in that the cars will race but only nine drivers will be awarded points that matter to them for the balance of the year – twenty cars and drivers to honor ChampCar, but only nine with skin in the game. The Indy Racing League has provided a path of unification where two open-wheel racing series merge into one, but this year, the IRL Management (other than season points recognition for the transitioning drivers) is nowhere to be found. No visibility, no public relations, no official status. This lack of interest extends all of the way to the non-recognition or listing of this 34th edition of the Grand Prix in Long Beach to their website where the race is not mentioned. The Long Beach Motorsports Walk Of Fame for 2008 was a breath of fresh air and a walk on the honor side. The honor of the accomplishments of sportsmen inducted, the honor of a valiant legacy of American open-wheel racing, and the honor of a city, spirit, and a venue that have no equal. Long Live the Grand Prix of Long Beach … from Shoreline Drive to the short shute along Pine Avenue. Now let’s go racing and make some history. Let the “fine nine” go immediately to the front of the pack and have a Grand Prix race for the Indy Racing League ages. WALK OF FAME: Racers Mario Andretti, Parnelli Jones and Gary Gabelich are inducted. LONG BEACH - The man synonymous with the Toyota Grand Prix of Long Beach - Mario Andretti - is now a permanent part of the community. Andretti, who drove in the very first Grand Prix in 1975 and won the race four times, was inducted into the Long Beach Motorsports Walk of Fame on Thursday, along with Parnelli Jones and Gary Gabelich. They were honored in an hour-long induction ceremony attended by city dignitaries, family members and racing fans. "(Coming to Long Beach) is like coming back home," said Andretti, who won in Long Beach in 1977, 1984, 1985 and 1987. "I don't know anywhere on this planet I feel more welcome than Long Beach." Andretti said he wasn't confident race founder Chris Pook's idea for a street course in Long Beach would work. "I thought it would never fly," he said. "But I could see it would have a chance when I saw how the city of Long Beach got behind it. The city fathers saw this as a tremendous opportunity to bring this city to the attention of the world. "Look at this town now," he continued. "This city is a destination." Grand Prix Association of Long Beach CEO Jim Michaelian said Andretti's thrilling 1977 victory over Jody Scheckter and Niki Lauda "put the stamp of authenticity on this event." Andretti, now 68, won four IndyCar titles and was honored as United States Driver of the Year in 1967, 1978 and 1984, the only driver ever chosen in three decades. Jones won the Indy 500 as a driver (1963) and as an owner (1970-71) and also earned four NASCAR victories in 34 starts. He won numerous midget and sprint car races and is a legend in off-road racing as a driver and owner. In 1975, Jones owned the Formula 5000 car Andretti drove. Jones, 74, was remembered by one speaker as the fiercest competitor he ever faced on a track. Gabelich, perhaps more than any of the inductees, had the need for speed. The San Pedro native began drag racing at 16 and won the first-ever jet-powered drag race in 1959 - topping 200 mph - at 19 years old. He's best known for the Blue Flame, his 37-foot, 5,000- pound car powered by a liquid gas-hydrogen peroxide rocket engine that broke the land speed record in 1970 at 622.287 mph. The record stood for 13 years. Gabelich later developed a love for powerboats and set the National Drag Boat Association record at 200.44 mph in 1969. Gabelich was killed in a motorcycle accident in 1984. "It is beyond an honor for Gary to be recognized with two legends of racing," Councilwoman Gabelich said. While preparing her remarks for Thursday, Gabelich randomly chose one of about 20 books she has on land speed records, trying to find the words to explain why some choose to race the clock instead of each other. The book she grabbed was "Land Speed Record" by Cyril Posthumus, published in 1971, with a forward written by Gary Gabelich. In it, he wrote land speed records are "the measure of man's assault ... on speed and time." He also wrote he still looked upon the Blue Flame as "a beautiful woman." "Today is the most special of all," said Rae Gabelich. "To be recognized in the city he called home ... is an honor." The Toyota Grand Prix of Long Beach is set to be televised live on ESPN2 - The race is scheduled to start on the track at 1:00pm PT. Long Beach 2008 – The Panoz DP01’s Last Hurrah! After a little over one year of service, North American open-wheel racing’s ChampCar World Series racing platform, the Panoz manufactured DP01 will see its last competition this coming weekend - April 18-20, 2008. The 34th Toyota Grand Prix of Long Beach will be run through the streets and down Shoreline Drive featuring the DP01 and scored through Indy Racing League 2008 Championship points due to the unification of American rules open-wheel racing series between the ChampCar World Series and the Indy Racing League. In the initial test of the chassis back at the end of August, 2006, the car spent testing week in the capable hands of two-time Champ Car race-winner Roberto Moreno. Roberto piloted the new machine through every lap of the more than 600 miles in searing 90 degree conditions of the week despite not having been in a Champ Car since 2003. The DP01 Sebring test team included engineers from Champ Car, Cosworth, Pi Research and Elan Motorsports along with Hewland and Performance Friction Brakes. "It was nice to be back in a Champ Car and nice to have that kind of power at your fingertips again," stated Moreno at the time of the initial tests at Sebring International Raceway. "I couldn't be happier with this car. The new aero package is really nice and I think it will be great for the guys once the teams get ahold of it. We are really sticking well in the mid-speed corners and the car is really balanced well aerodynamically and we haven't even thrown anything at it from a standpoint of trying to gain mechanical grip. I think that the team has done a great job with this car." The Panoz DP01 was developed to be safer, and less aero-dependent while racing closely with other cars. The new model had numerous changes from the previous Lola car, including more downforce from the underbody. Approximately 60% of the car's 5,500 lb (2,500 kg) of downforce at 200 mph (320 km/h) will come from the bottom of the car. This is done by directing the air in a way to create downforce on the car, by sucking it to the racetrack. This will put less dependency on the front and rear wings in the event of a failure at high speed. Some believe that the Panoz DP01 is a better chassis than the IRL standard Dallara (if not just newer) but both chassis lack the meeting of cockpit measurement and safety standards set out by the FIA Institute. It is the intention of the IRL that the next generation of chassis employed (and hopefully introduced by the 2010 season) will conform to an international standard in design safety. If the cockpit of the Panoz DP01 was FIA compliant, it still would be doubtful that a Tony George chaired operation would allow that much of a merging to take place within the IRL. 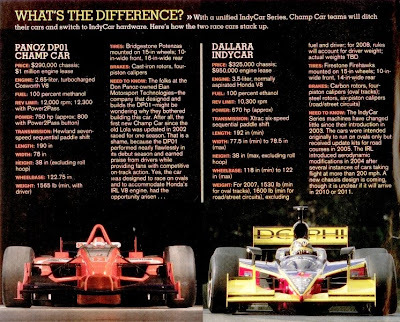 Even though the DP01 was designed to fit with the IRL specified Honda engine, and the dimensions are roughly equal enough to run with the current and older Dallara chassis, this chassis is a “ChampCar” chassis and thereby does not fit in the management scheme of things. The list features thirty-two drivers named for the 39 car entries, an increase of seven drivers over last year's initial entry list. Penske has entered a 77 car just on the off chance that Sam Hornish (currently with a full year ride at NASCAR) commits and will be qualifying it. Hopefully, Paul Tracy will end up in the no.22 Vision car. Contract sticking points with his former team, Forsythe, currently has him sidelined. We know that there has to be others now that there is unification. 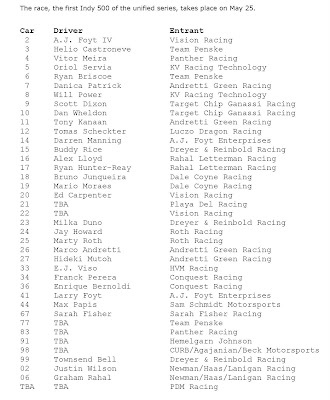 Pacific Coast Motorsports is not listed but it is expected that Mario Dominguez and Tyler Tadevic (Team President) can pull a package together for the 500. With all of the good drivers without a ride, there has to be more teams and personnel to rise up to the challenge. 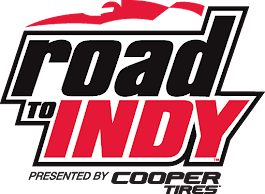 INDIANAPOLIS — The unification of U.S. open-wheel racing put 12 rookies, including recent IRL IndyCar Series race-winner Graham Rahal, among the initial list of 32 drivers entered in the Indianapolis 500. Overall, 39 cars were on the entry list released Friday by the Indianapolis Motor Speedway, but most of the teams will have at least one backup car for each of their drivers. "The entry list is very healthy this year," Speedway spokesman Ron Green said. "It's actually similar to what we've had in the last couple of years from an entry standpoint, but it's healthier from the standpoint that there are more car-driver combinations already established going into the month of May." Practice for the May 25 race will begin with the annual rookie orientation program May 4. The 19-year-old Rahal, son of car owner and former Indy winner Bobby Rahal, won his IndyCar Series debut last week in St. Petersburg, Fla., becoming the youngest winner of a major open-wheel race in North America. He'll drive the No. 06 Dallara entered by Newman/Haas/Lanigan, one of the former Champ Car teams that joined the Indy Racing League. The recent merger, which also brings Newman/Haas/Lanigan teammate Justin Wilson of England, includes KV Racing (Oriol Servia and Will Power), Dale Coyne Racing (Bruno Junqueira and Mario Moraes) and Conquest Racing (Franck Perera and Enrique Bernoldi) among the new participants at Indianapolis. "The unification of the sport, as we all expected, is making the entries, not only for the Indianapolis 500, but for the other IndyCar Series races, much stronger," Green said. "The people that really benefit are the fans that like to see all the car-driver combinations come together for the month of May." Besides Rahal, the rookies include Hideki Mutoh of Japan, who replaced last year's Indy and series champion Dario Franchitti with Andretti Green Racing. Franchitti left the series to race in NASCAR this season. Former winner Sam Hornish Jr. also left the IRL for NASCAR and was replaced on Team Penske by veteran Ryan Briscoe. The former winners entered this year are Penske's Helio Castroneves (2001 and 2002), Buddy Rice (2004) of Dreyer & Reinbold Racing and Dan Wheldon (2005) of Ganassi Racing. The other rookies include Bernoldi, Moraes, Perera, Power, Servia, Wilson E.J. Viso, Jay Howard, Ryan Hunter-Reay and Alex Lloyd. Howard and Lloyd are former champions in the Indy Pro Series - now known as Firestone Indy Lights - the IRL's top developmental series. The 12 rookies would be the most to start the race since 13 newcomers started in 1997, the year after the IRL began. For the second straight year, three women are entered: veterans Danica Patrick, Milka Duno and Sarah Fisher, who will drive for the first time as owner of her own team. In an era where transitioning from a two sanctioning body open-wheel series to one supreme governing and sanctioning body to stage open-wheel automobile racing, information is very hard to come by. The websites of both governing bodies are not mentioning information about the race through the streets in Long Beach and it is tough to understand why. As for the ChampCar World Series website, it is a little hard to see why they would apply any more resources than they have to. They are the series that is being merged into the Indy Racing League. The CCWS is no longer and has applied for bankruptcy protection as the doors swing shut so why maintain the website. The Indy Racing League has other issues. For their part, they are choosing to behave as if the race in Long Beach doesn't even exist as far as their website, indycar.com, is concerned. Not one mention in their articles, their schedule, their advertising (if any, as of the posting of this article), even though they are going to award full and sanctioned points to count toward the 2008 Series Championship. Some of the reasons for this lack of information coordination range from a conflict between Honda who supplies the engines for the IRL cars and the master sponsor of the Long Beach race, Toyota, to legal articles mentioned in the bankruptcy papers filed on behalf of the CCWS that limit the IRL to even show their face - WHO KNOWS ... but the fans in Los Angeles suffer without a care from the sanctioning body. To add further insult to this purposeful tactic, the first information about a driver line up for the race has to come from a posting at a British Formula One Fansite! autosport.com has just announced a 20 car field for the Toyota Grand Prix of Long Beach. This brings the number of drivers where the points actually matter to nine (in BOLD) who will be fighting for a points paying position with eleven drivers who are racing this race as the FINAL race for the ChampCar World Series and do not have a ride with the IRL series sanctioning body for the 2008 season. Are you all ready … I am just going to have to say it! 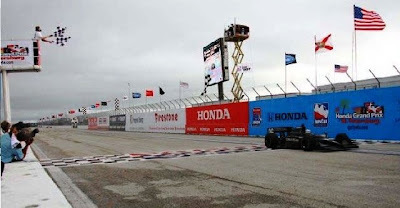 If this lack of support and excitement from the Indy Racing League to the fans of open-wheel racing in Los Angeles continues, 2008 will have to go down as a mutt year in the annals of Long Beach Grand Prix history. The race is due to be held April 18-20, 2008 with civic activities to begin one day earlier at 1 p.m., racing greats Mario Andretti and Parnelli Jones will be inducted into the Long Beach Motorsports Walk of Fame (Pine Ave. at the Convention Center), joining past inductees Phil Hill, Dan Gurney, Paul Newman, Carl Haas, Chris Pook and Brian Redman. Former land speed record holder Gary Gabelich will also be inducted posthumously. This is a great story (again, with apologies to Kenny Chesney)! It goes from No Parts (and no race for the first race), No Sponsor (Hole In The Wall Camp is, team owner, Paul Newman's charity), to No Problem for the first win by a CCWS T-Team! Good on Graham Rahal (and father Bobby) of Newman/Haas/Lanigan Racing. The reason this IS a great story has to do with many reasons. Graham Rahal came close to winning his first race at the age of 18, last year in the ChampCar World Series when he came in second place on the podium for the Grand Prix of Houston, April 22, 2007. Rahal came back from a spinout early in the Saint Petersburg race, Sunday afternoon, to become the youngest winner in major open-wheel history. At 19 years, 93 days, Rahal broke the age record set two years ago in Sonoma, Calif., by another driver from a racing family, Marco Andretti, who was 19 years, 167 days old. With this win, the ChampCar World Series Transition Teams crack the ice on its first win in only two races proving that the “T-Teams” ARE competitive with recognized, established leading teams in the IRL in this first season of unification. Many experts speculated that at minimum, it would take six to ten races for the CCWS T-Teams to catch on to the racing set-ups of the IRL Dallara chassis - Honda engine package. This win was not only won on a closed temporary street course (a CCWS strong point), it was won through strategy. The driver who came in second had won the race the previous two years running … and was poised, through a strategic last pit stop where Helio Castroneves, of Team Penske, took on fuel only (no tires) and leaped forward seven spots to come in right behind Graham Rahal for the re-start. The trick in strategy at this very point, and very easy to overlook, is that Newman/Haas/Lanigan Racing (four time CCWS Championship winning team) kept Graham Rahal out hoping that the car would have enough fuel to finish the race. 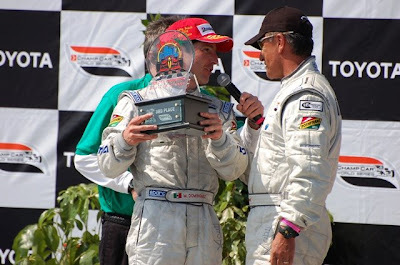 The strategy gamble paid dividends in this unified 2008 IRL season by posting a first ever CCWS T-Team race win in the second of eighteen scheduled races. Graham Rahal had help with fuel saving yellow flag laps where the racers were slowed and held behind the pace car for several laps while track crews cleaned up after cars that had collected the wall, or each, other around the track during the last stint before the checkered flag that would end the race. In the final re-start with just a few laps left, it was feared that Castroneves, with all of his winning experience (two-time Indy 500 Champion), would be able to get the drop on the much younger, non-winning Rahal, but Graham’s age hides the fact that he comes from a grand racing DNA tradition being the son of past Three-Time CART Champion, Indy 500 Winner (both as a driver and team owner) and IRL team owner (Rahal-Letterman Racing), Bobby Rahal. Graham Rahal answered the challenge at the re-start by bringing the field up to racing speed before the first turn of the main straightaway to receive the checkered flag and resume racing. All Helio Castroneves could do is maintain position as Graham placed a little distance between them until the end of the rain-dampened race. Some of the best news for the Indianapolis Racing League in this year of unification is how well the CCWS T-Teams did in a race venue that was completely new to most all of the teams and drivers. Five of the top ten places were occupied by T-Team drivers. P1 - Graham Rahal (Newman/Haas/Lanigan Racing), P4 - EJ (Ernesto) Viso (Former Minardi Team USA – HVM Racing), P5 - Enrique Bernoldi (Conquest Racing - with consulting from Forsythe), P7 - Oriol Servia (KV Racing Technology), P8 - Will Power (KV Racing Technology). That is competitive no mater how one slices it! The Indianapolis Racing League wants to say "Transition tag gone!" (as per an article posted at indycar.com by Dave Lewandowski) but until the IRL management shows an interest in the race weekend at Long Beach (which happens over the same weekend as the engine supplier race (Honda) held in Motegi, Japan), the ChampCar teams will always be viewed as T-Teams! Com' On! the Long Beach Grand Prix race can not get any play as being listed as a race in the schedule at indycar.com website - No opportunity to link to event information - No ticket sales - NOTHING (as of the writing of this post). To be fair, the ChampCar site isn't much help either, although, this site at least has a link to additional information. Again, Good on Graham Rahal and the ChampCar World Series Transition Teams for a great showing in the streets of Saint Petersburg, Florida before these guys give one last hurrah to the PANOZ DP01 through the streets in Long Beach. 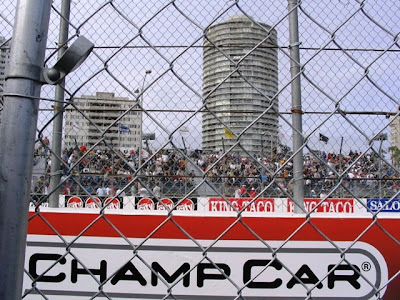 The DP01 chassis will be featured in the final ChampCar race, and the only ChampCar race that will award IRL points toward the 2008 IRL season championship in the streets at the Toyota Grand Prix of Long Beach, April 17-20, 2008 - Long Beach, California. See you all on Shoreline Drive! 1.) Rahal's win broke three-team, 37-race streak: Graham Rahal's victory in the Honda Grand Prix of St. Petersburg April 6 for Newman/Haas/Lanigan Racing was the first by a driver for a team other than Andretti Green Racing, Target Chip Ganassi Racing or Team Penske since Aug. 14, 2005 - a span of 37 IndyCar Series races. Fernandez Racing's Scott Sharp won the race at Kentucky Speedway in 2005 before the streak started. Read that as T-Team success! 2.) Web traffic spikes at indycar.com: The unification of open-wheel racing under the IndyCar Series banner has already resulted in increased car counts and a renewed interest among sponsors and fans. Another sign of the growing excitement surrounding the unified IndyCar Series is the drastic increase in web traffic at the series' official Web site, http://www.indycar.com/. 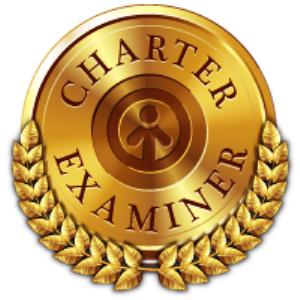 The site, which unveiled a new, improved design in March, has seen tremendous growth since the beginning of the year. Read this as people wanting to get information on unification but can not get any. This article mentions that there is a race in Long Beach … but try to get any direct information on the Toyota Grand Prix of Long Beach from the indycar.com website. This format is justly named. The format lent an interest to the affair all-of-it’s-own and it IS a knockout. The way it is structured is that three rounds with four sessions for timed qualifying are held for all of the qualified entrants (in this case at Saint Petersburg – 26 cars). Two groups of 13 cars each are randomly drawn to compete in Round 1, with both groups having 20 minutes to post their best lap times. The top six cars from each group advanced to Round 2, where they received 15 minutes on the circuit to post their fastest times. The top six cars from that group of 12 advanced to the Firestone Fast Six and the six cars start fresh whereas times do not carry over from one round to another. Three drivers from each of the two groups that were randomly drawn for the first round of qualifications advanced to the "Firestone Fast Six". 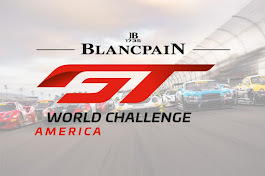 The dramatic qualifying format debuted on the 1.8-mile, 14-turn temporary street circuit at Saint Petersburg, Florida will carry over to all other Indianapolis Racing League road/street events this season. The qualifying sessions had no accidents and all went off with several notable surprises along the way. No. 8 Will Power (1:02.7752; 103.422 mph); No. 11 Tony Kanaan; No. 06 Graham Rahal; No. 34 Franck Perera; No. 14 Darren Manning; No. 17 Ryan Hunter-Reay. Notables: Perera's final lap (13th) bumped Hideki Mutoh from advancing. … Danica Patrick finished nine in the group. … Power's final lap bumped Kanaan from the top spot in the group. … Mutoh was atop the lap time chart halfway through the 20-minute session. … One of the three Andretti Green Racing cars (Kanaan) advanced. No. 02 Justin Wilson (1:02.7341; 103.293 mph); No. 6 Ryan Briscoe; No. 26 Marco Andretti; No. 3 Helio Castroneves; No. 5 Oriol Servia; No. 10 Dan Wheldon. Notables: Wilson moved to the top on his 12th of 13 laps. Earlier in the session he came to a stop in Turn 8. … Wilson wasn't in the top six at the halfway point of the 20-minute session. … Scott Dixon, who has been the race runner-up the past two years, did not advance (seventh). … Both Team Penske cars (Briscoe, Castroneves) advanced. Six cars advance - "Firestone Fast Six"
No. 8 Will Power (1:02.1355; 104.288 - fastest time recorded in all of the qualifying sessions ); No. 11 Tony Kanaan; No. 6 Ryan Briscoe; No. 02 Justin Wilson; No. 17 Ryan Hunter-Reay; No. 3 Helio Castroneves. Notables: Castroneves jumped from 10th on the time chart to making the final round in the final minute. 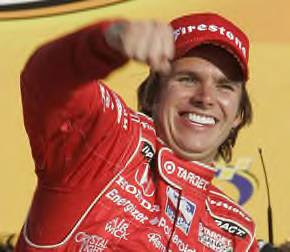 … Both Target Chip Ganassi Racing cars did not advance; Wheldon was eighth in Round 2. … Marco Andretti was 12th in the session. Firestone Fast Six fill out the top six positions in the starting grid. Can anyone one believe that HALF of the top ten positions on the grid are occupied by drivers and teams that have transitioned from the ChampCar World Series (CCWS T-Teams in bold)? Many of the experts were fond of saying that “it will take about six to ten races” for the T-Teams to become competitive, tell that to Will Power who posted the fastest time on the track at 62.1355 seconds. This time was about one-half a second faster than the eventual Pole Position speed of Tony Kanaan at 62.5322 seconds. How about a P2 and a P3 starting position for Will Power and Justin Wilson respectively – Great stuff ... and Will Power will have no wing to stare at when he takes the checkered flag to start the race. Good On! 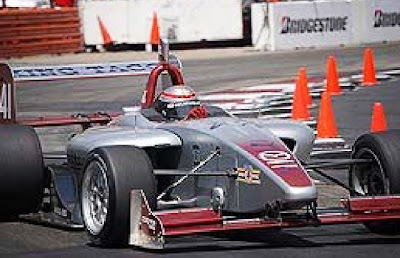 the CCWS T-Teams, if round two of 2008 at Saint Petersburg, Florida is any indication of the success that comes from a unified series, this will be an exciting year. The second round race can be seen on ESPN starting at 11:30 am PT, Sunday, April 6, 2008. Too bad we can't have all of these guys to race on Shoreline Drive at Long Beach THIS year!